The event was created in 2003 when the European Committee of the Regions invited Brussels-based local and regional representations to the European Union to open their doors to visitors simultaneously. One year later the European Commission's DG for Regional Policy also joined the adventure. Developing from the initial concept, the event has become a European networking platform for experts in regional and local development. Exchange of good practice in economic development and social inclusion, cross-border cooperation, public-private partnerships, regional innovation and community-led local development have become some of its many topics. The European Week of Regions and Cities is co-organised by the European Commission's Directorate-General for Regional and Urban Policy (DG REGIO) and the European Committee of the Regions (CoR). Other European institutions, European regions and cities in regional partnerships, and European associations can also become event partners. Help us to improve the sustainability of the #EURegionsWeek! 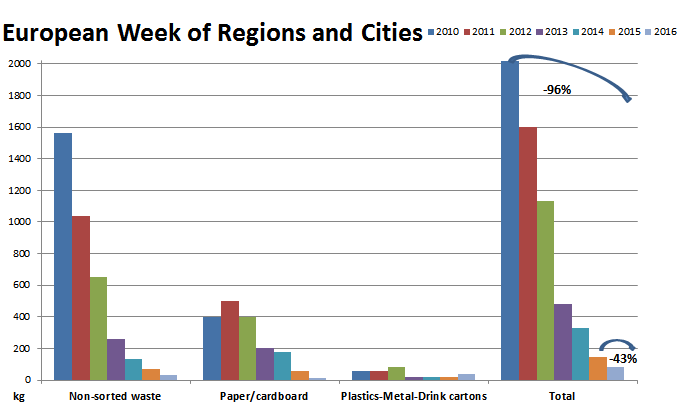 Reducing and sorting waste is a top priority of the European Week of Regions and Cities. The #EURegionsWeek wants to reduce print documentation even further, with the ambition to become a paperless event. We invite all partners to reduce print documents to minimum and to bring back any leftover documents. We also invite all partners and participants to sort their waste (glass, paper, PMD, organic waste) for effective waste management. Sorting of organic waste, including biodegradable paper cups, needs special attention as organic waste, due to its nature, is fed directly into the biogas plant. Help us to recycle and sort waste correctly!